Candace Lately: Jim's Steak & Spaghetti - Strawberry Pie Week! 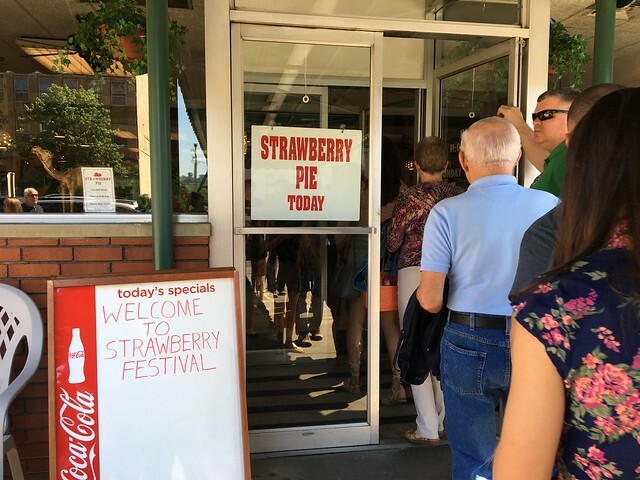 Strawberry Pie Week is legendary in Huntington. 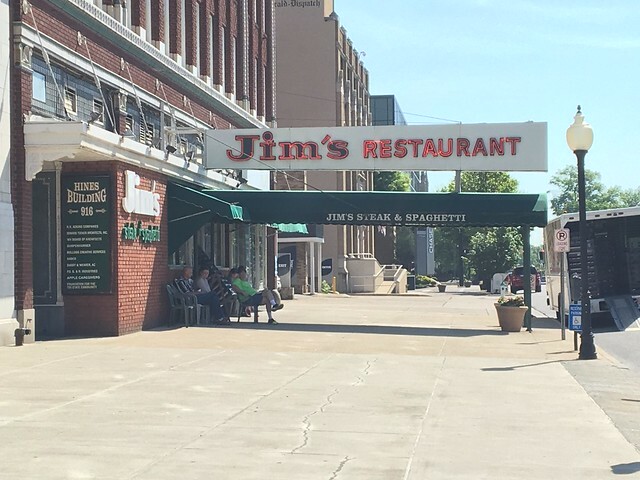 Jim's Steak & Spaghetti serves up their homemade strawberry pie just one week of the year - and it has cultivated a following in recent years. I've never tried it though I've been to Jim's before, and it's a West Virginia classic, so I made it a point to get my fill this year. 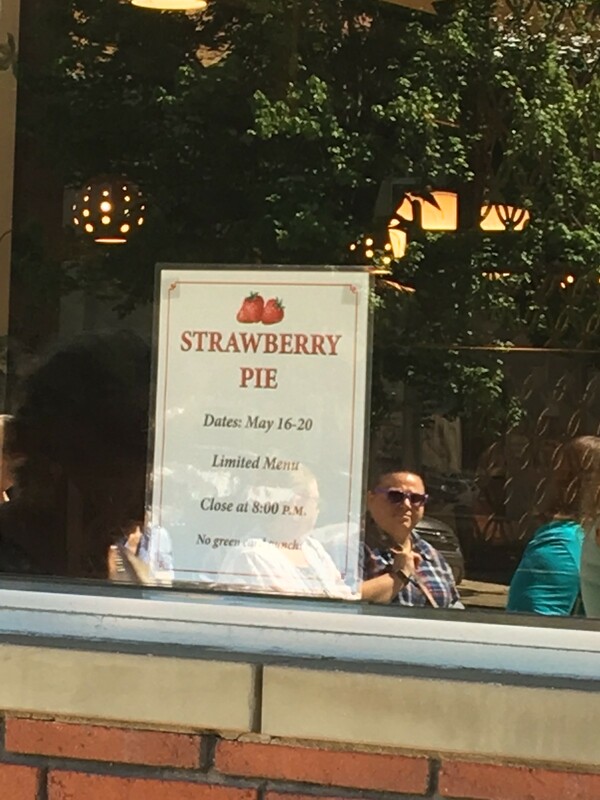 Jim's strawberry pie week starts the Tuesday after Mother's Day each year. So, I took that Tuesday off, woke up early, drove to Huntington and got in line. That's right, there was a line. I actually parked around 10 a.m., took a look and saw two people waiting, so I went around the corner and got a cupcake and a coffee. Took my time and then made my way back around 10:30 to see about two dozen people in line. That's when I decided I should get in place. Unfortunately, it was about 80 degrees this day and I juuuust happened to be outside of the shade. Just barely. 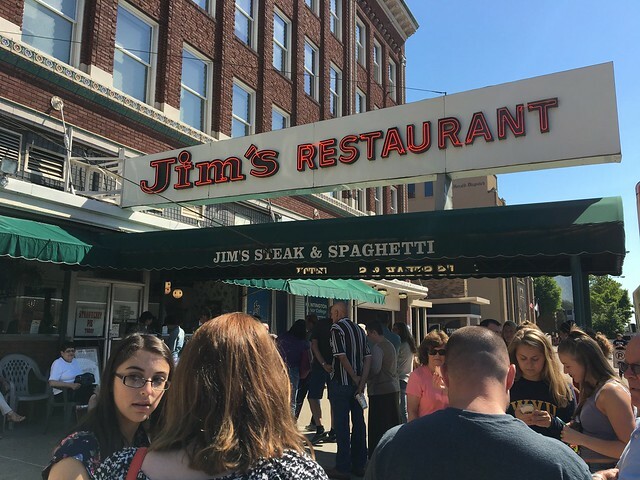 By the end of this week, if last year's history repeats itself, an astonishing 10,698 slices of pie or more will have headed out the glass front doors of Jim's, the popular downtown restaurant. 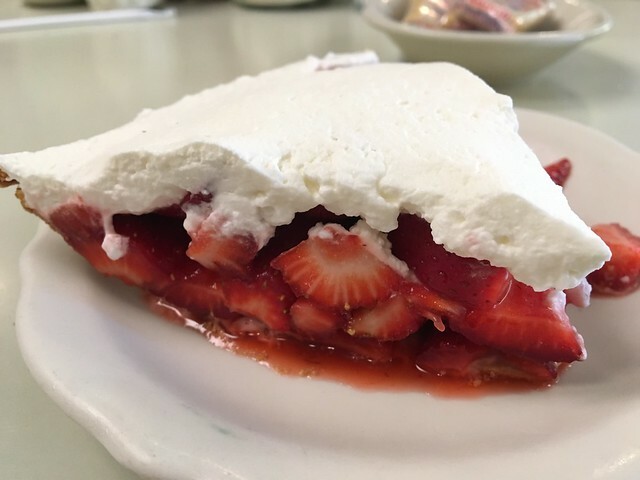 Made entirely from scratch by Patti and her daughter Michelle, Jim's famous strawberry pie is featured one week only, from 11 a.m. until 8 p.m. Tuesday through Saturday, May 16-20 (Herald Dispatch). 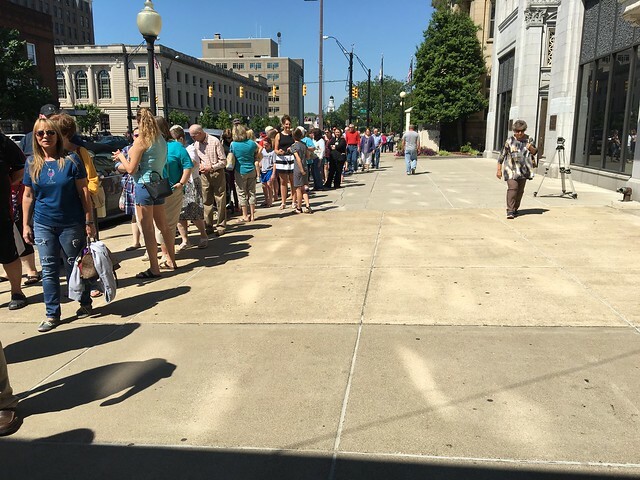 When the doors finally opened at 11 a.m., the crowd flowed inside, and the hostess was triaging as quickly as she could and directly people to sit. Within minutes, the entire dining area was full. Media was swarming to document every moment. Since I was alone, I sat at the end of the counter and ordered my pie. The service was ON POINT despite how crazy it was. I have no idea how they did it. 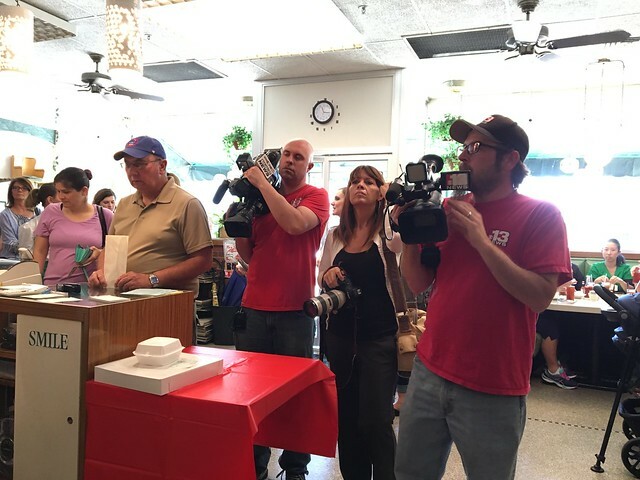 But, since I just came for pie and not the full lunch, I was one of the first to be served, and I was at the end of the counter, and that made me prime for media coverage. See this pie being delivered here? That's mine, and you can see me and my phone and my camera waiting. That photo above? That was my view to the right. So, the pie. It is quite delicious. 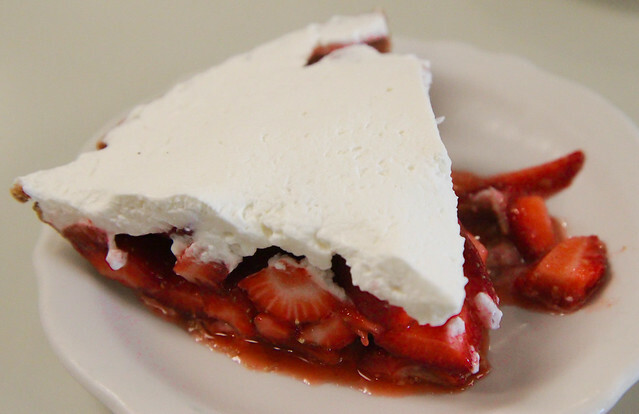 The crust is sweet and crumbly, the strawberries fresh and the cream on top is the perfect touch. I can definitely see why this little bit of heaven has a huge following. Since you can only get it once per year (and two slices of pie per customer! ), the line is no surprise to me. If I were local, I might be in line every day to get it. I'm a fan. And, it's an amazingly well-oiled machine. 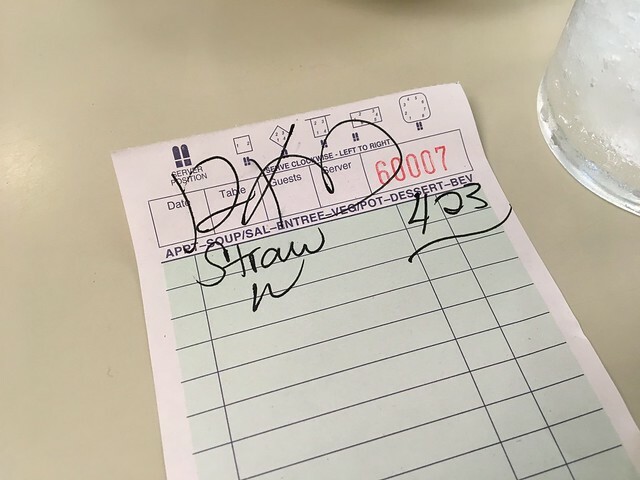 My longest wait was simply to pay because there were folks also trying to place to-go orders. But, I was in and out within 30 minutes once I was seated. That's impressive for the amount of people packed into that space. If you didn't get a chance to try the pie this year, mark your calendar for next year. And, get that second piece of pie to go.